Review: Oh Bridesmaids, what hath you wrought? The 2011 mega hit made a big buzz because it was a film written by women, starring women, not just for women, and exceedingly funny. First shrugged off as a female answer to the rowdy popularity of The Hangover, it quickly separated itself from the pack of imitators by matching that film laugh for laugh (often beating it). Being released the same summer as the inferior The Hangover: Part II, Bridesmaids was one of the most talked about films of the year…deservedly so. A year later comes another movie that draws obvious comparisons to Bridesmaids in tone, structure, and even casting (Wilson appears in both films but in different roles). Bachelorette was written and directed by Headland who adapted it from her stage play and it’s not hard to see why the material would have worked well as a live performance. Ribald humor, male strippers, and catty asides probably provided some nice laughs but having not seen the piece I can’t say how many characters/situations were added/embellished for the big screen treatment. 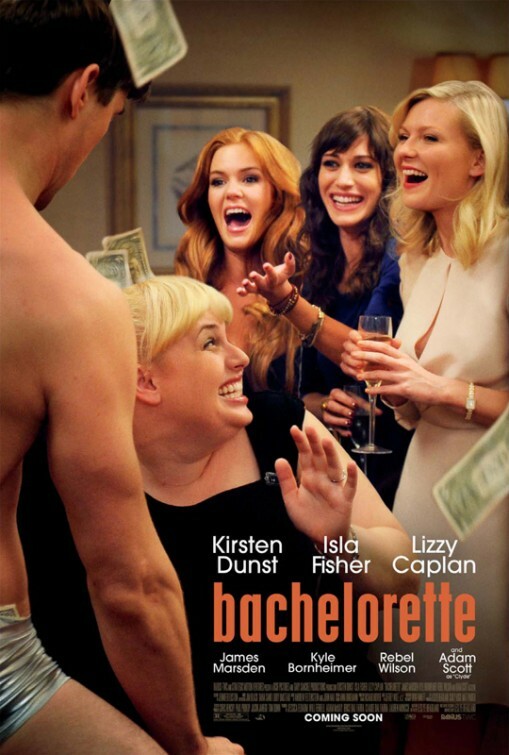 Providing a few nice laughs, Bachelorette unfortunately gets sunk in its multiple excesses of girls behaving badly. None of the three leads are crafted as particularly likable characters so it’s tough to get invested in their shenanigans as they prove to be awful bridesmaids and lousy friends. Without many/any redeemable qualities the women become exhausting cartoons and that creates a rift with the viewer. It takes a rare performer to make an unlikable character involving and sadly Dunst is far from up to the task. As the head honcho bridesmaid, it’s never clear why she’s friends with the bride (Wilson, operating in a far less quirky vibe than she has in Bridesmaids, What to Expect When You’re Expecting, and the upcoming Pitch Perfect) or why she’s so dang angry. Dunst just doesn’t have the timing, skill, or commitment for comedy and she’s in way over her head before the film is even half over. Caplan and Fisher have demonstrated a knack for comedy in the past but here they are each playing such stereotypical roles that you know where they’re going to end up long before they do. I’ve a feeling that Caplan will regret playing such a snidely clueless doormat and Fisher will wish she hadn’t played yet another total idiot but both actresses at least roll up their sleeves and dig into their parts which is more than Dunst can say. Like Bridesmaids, the men operate merely as pawns for the women to chew their scenery with. It’s too bad that the talented guys aren’t called on to do more than move the show along without much functionality but Scott, Marsden, and especially Bornheimer do the best with what they have. Headlund makes her directing debut here and perhaps a more experienced director could have taken her paper-thin script and made something of it. As it stands, there’s not much style on display and the cinematography by Doug Emmett leaves much to be desired. It’s nearly a point and shoot affair and one wonders if Headlund couldn’t envision her script outside of a confined stage-like setting. It’s clear from the get-go that this movie got made simply because of the plot description in the hopes of another success with female audiences. It’s not a total wash of a film, let’s be clear. It’s just a glossy copycat film that is trying to capitalize on the success of a hit film without having to really acknowledge that fact. Having been released On Demand before debuting in the theaters Bachelorette has been a surprise hit, moving to the top of the charts…becoming the first film to do so without first being released in theaters. That may bode well for the film down the road when it’s released in early September…or it may signify that it’s destined to be a Ladies Night In experience.